Multi tier firewalls are mandatory for any internet protection setup that has to survive a compliance audit regarding ISO 27001 or German BSI Baseline Security (BSI IT-Grundschutz). 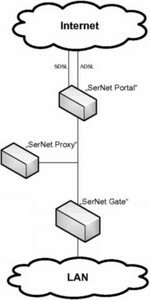 SerNet offers those firewall systems and integrates products from different vendors: state of the art packet filter or next-generation firewalls from Palo Alto Networks, SOPHOS et al. are combined with high-capacity application level gateways. The figure on the right shows the principal schema of a firewall setup. On customer request other systems are added like web, mail, SQL server, client or site2site VPN and more.